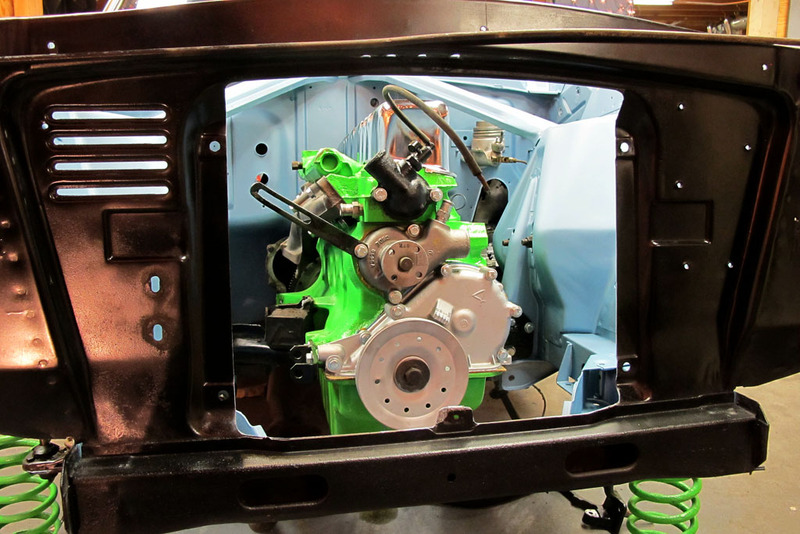 Home » How-To & Tech » 1960 Ford Falcon: 3 Days to Go – Engine is In! One of the things holding us up from putting the engine in last night – is we couldn’t attach the transmission without getting the pilot bushing out of the old engine and into the “new”. Ethan called up a friend, who’s the Go-To-Guy for getting things taken apart, to borrow the tool. His friend informed him no special tool is needed…just some toilet paper and water. If Joe-Schmoe were to say this, Ethan or I probably wouldn’t have believed it… but since Go-To-Guy was telling us, it must be true. So Ethan grabbed a wad of wet TP and shoved it in the hole – followed by hammering a metal object that fit snugly through it (in this case a socket). Taking a hammer to the socket, the TP got smashed down and another wad of TP was added. Ethan was beginning to think he’d had his leg pulled when, after a few rounds of shoving TP in, the bushing began to smoothly get pushed out! Hydraulic pressure at it’s best! Success and a smart new “tool” to keep filed away in the ol’ brain. Another friend came over this evening to pitch in where needed – it’s always good to have an extra set of hands when putting in an engine (especially since I’ve never done it before!) 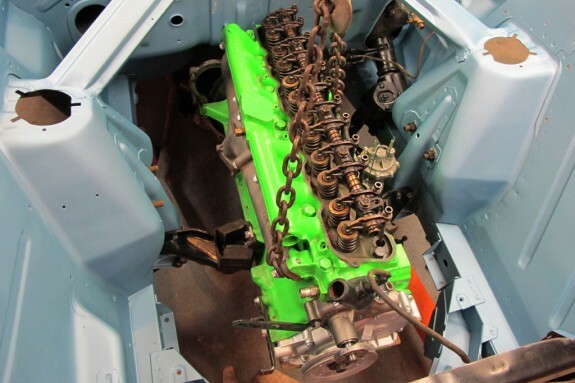 After the steering column and a couple other things were bolted back into the engine bay, and the transmission was added to the engine, up and over it went into it’s new home. 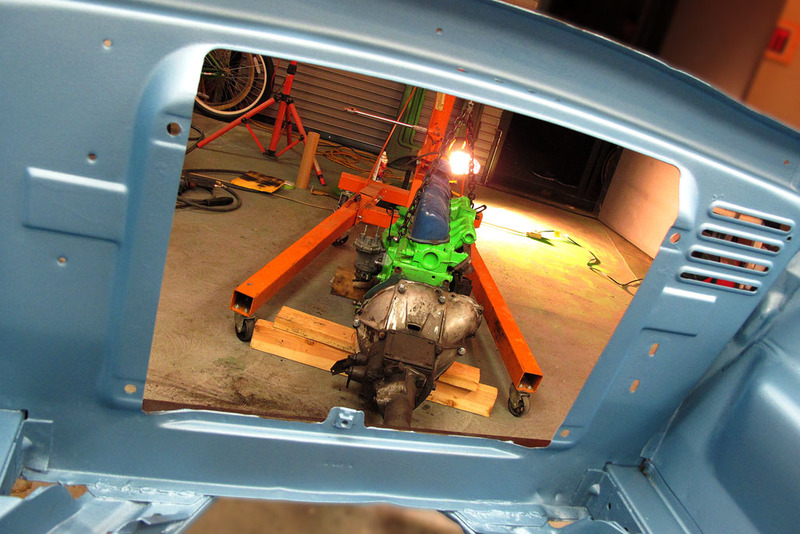 The process went smoothly – taking less than half-an-hour for the placement. We did make a couple scratches on the firewall, but those will be easy enough to fix later. Ethan bolted on the motor mounts while I attached the crossmember. As the cleaning stops past the firewall, I got nice and greasy under the Falcon… which felt good for a change! I’m just not used to working in such clean car environments. It seems to be coming together nicely…but there’s still an awful lot more to connect! Can we get it done by the hair of our chiny-chin-chin? !